Happy Friday friends! I know I'm not alone when I say that I have been absolutely confused with what day of the week it has been all week long - Tuesday felt like Saturday and Wednesday felt like Monday, so happy to see Friday! Before we get too far into the new year, I wanted to recap our holiday! 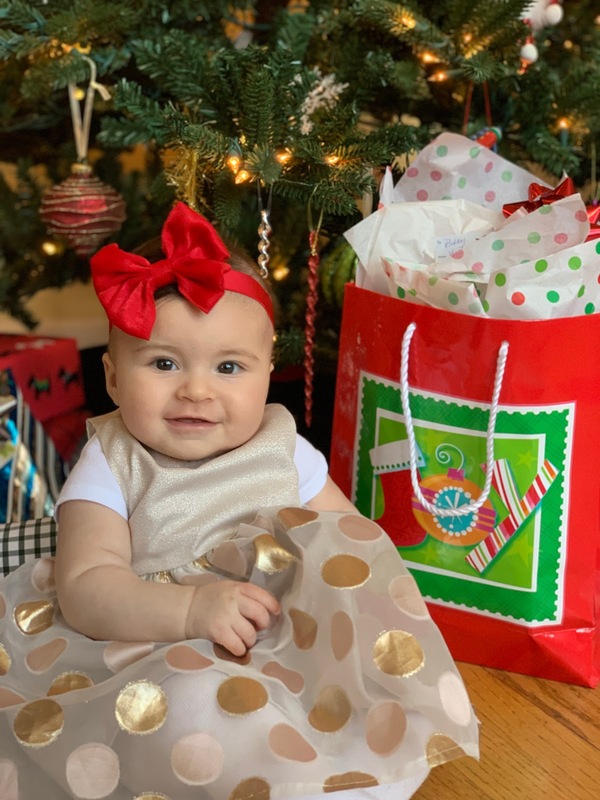 I know that Sophia had absolutely no clue about what was happening, but that didn't stop us from making sure we captured everything from her first Christmas! Her face in this photo cracks me up! We started the holiday at my sister's house with Sophia being incredibly spoiled by her cousins! I was so touched (to the point of tears) that my nieces and nephew saved their money to each buy Sophia a gift from them. It was one of the sweetest moments and they were more excited to see her open their gifts than to see what they got! I loved getting to dress her up in bows and the cutest gold ballet flats - that she's worn 4 times already, so I'll say that's a great return on investment for me! On Christmas Eve we packed up the car and headed to my sister-in-law's house! When I say packed up the car, I mean we took everything with us - including her bathtub...for two nights! I chalk it up to being first time parents and wanting to make sure we have everything with us! We didn't go too crazy when it came to gifts, mostly because I knew that family members would be gifting Sophia a ton and she's so young, she was more interested in the wrapping paper than the actual toys! Our big gift was this Pottery Barn Kids Anywhere chair in the regular size knowing that she will grow into it as the years go on. These leggings from Loft are seriously so comfortable and flattering! 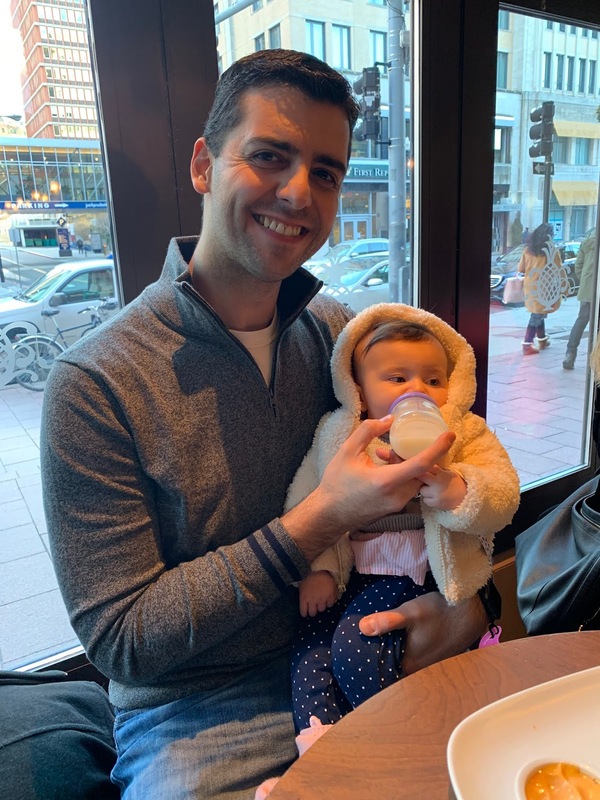 Between Christmas and New Years day we strolled around to take in the unseasonably warm weather in Boston, Sophia went to her first birthday party & we celebrated New Years Day with brunch at one of our favorite restaurants - Max Brenners - best waffle fries around! It was a mostly relaxing holiday season and I'm honestly feeling more refreshed for this new year than previous years!! Wishing you all a wonderful first weekend of 2019! She is just so precious! I love her little polka dot dress -- she's already so stylish -- just like her momma. I've been so confused on the day of the week, too! Love her little dresses you've put on her! I know she's fun to dress up! And I love that PB chair! That's something I plan on buying, too! How sweet of your nieces and nephew to think of Sophia on her first Christmas! Cousins are the best. A relaxing New Year sounds like the best way to ring it in. I told J I'm done with New Year's trips unless it's to a beach lol. Happy New Year B! How sweet about your niece and nephew; so precious! And we got Walker an Anywhere Chair on his first Christmas and he's nearly five and *still* uses it! It's a great gift. And girl, we took EVERYTHING with us for years and years. Ha! Just know you're not alone! She is just beautiful and looks so big! You look gorgeous as well, and it looks like y'all had a great holiday! :) Happy New Year! What a beautiful recap of what sounds like the happiest of holidays for your sweet family! Wishing you an amazing 2019, friend! xo! 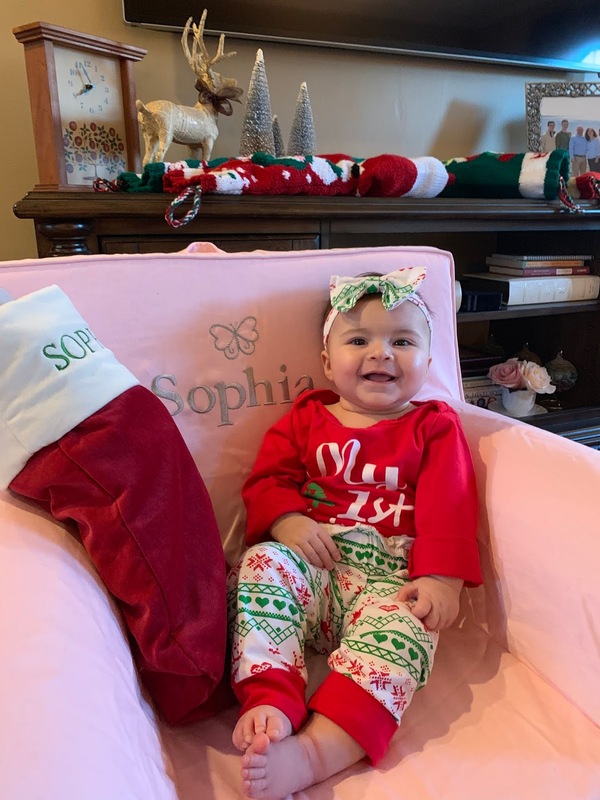 Looks like Sophia had a wonderful first Christmas! Yesterday I swore it was Tuesday. The struggle was real this week. What a beautiful recap! Wishing you all the best for 2019! She will grow into that chair faster than you could ever imagine. I love her cousins saved their money for gifts for her. That's precious. What a cute first Christmas. I love those Pottery Barn chairs. My girls just got huge bean bag chairs from there. So many beautiful pictures. I may have teared up hearing about her cousins. So sweet! Enjoy your weekend! What a wonderful break y'all had! So sweet of her cousins to save their money for a gift! That's adorable! Love all these photos! Happy New Year! What a great first Christmas for Sophia! You will love that chair, my nieces still love theirs and are in school! Happy New year! Such cute photos! 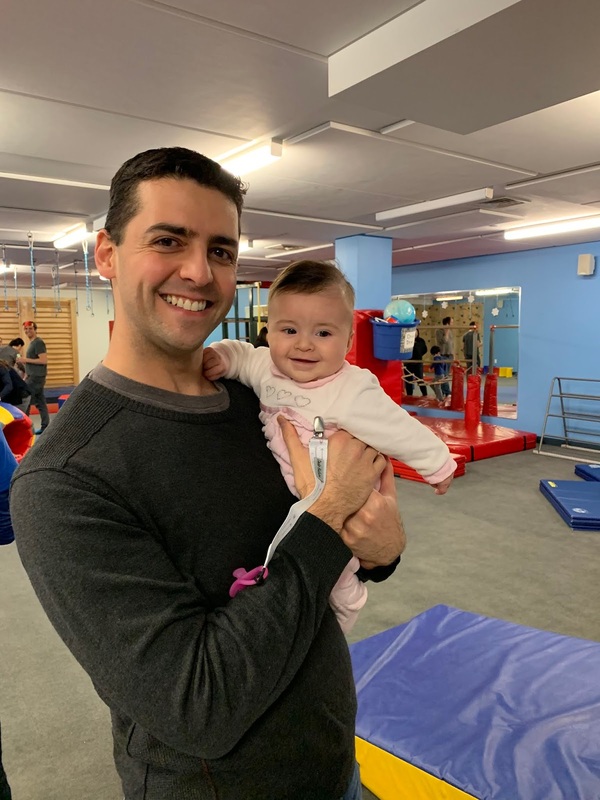 You are such an adorable family and your daughter is so cute! 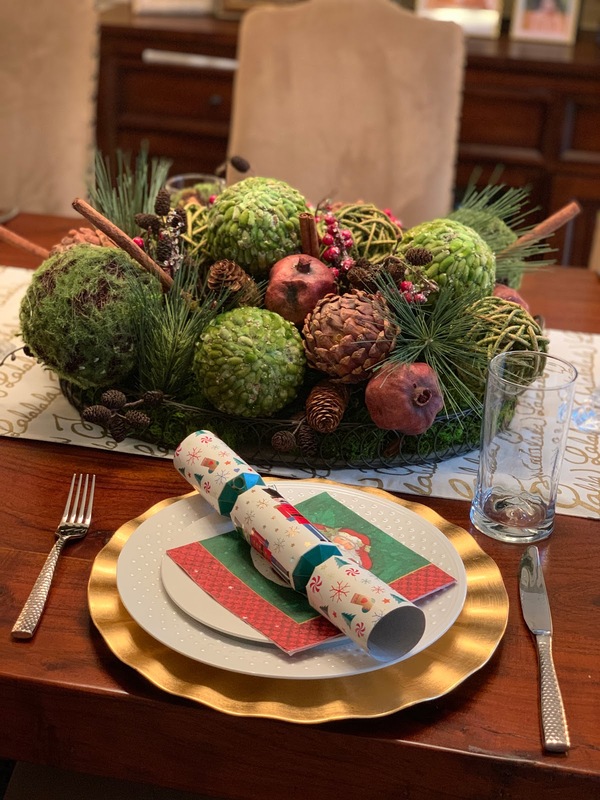 First Christmases are always so special! So good to hear that you feel refreshed for the new year! Your family photo is beautiful - I homed in on those little gold shoes and thought 'I bet you had so much fun dressing her up this Christmas!) - only to see you mention it later. How do you stop yourself buying far too many clothes for her haha! I think I'd need to set a baby clothing budget, which sounds kind of mad, but living in a city like you do, it must be so hard! Your holiday photos are just delightful and Sophia is too precious for words!!! What a cutie!! xoxoxo Happy New Year! Aww! Sophia's first Christmas! Your all looks so great (and happy)! Between Christmas and New Years I always struggle to remember which day it is. Then I wind up having to take extra days off and it is a wonder that I keep things straight ha ha! Looks like you all had such a wonderful Christmas! Sophia is so stinking cute. I swear she is smiling in almost every picture!